LocalBooty.com has a fishy smell from miles away, especially with its way too simple registration procedure allowing almost anyone to join and make fun or worse with a fake profile that needs only an email address. When you actually don’t need to say a few words about you as a person or check a few boxes to let the others know what you are interested in, you can easily manipulate the service by creating dozens of profiles just to mock others. Not to mention additional dangers like data thieves and cybercriminals who are only waiting to find someone who is free to share info with bots thinking that they are people. Not only is this “Booty” exposed but it is totally burnt by the sunlight. Having no special security software keeps me usually in alert mode, and poor refund policies make me instantly find my own way to the door out in search for a much better and more generous place. A “No Refund” policy not only speaks scam but it shouts deception. What a way to get your money out of your pockets established by this fraudulent dating service with unethical sale tools. 1. LocalBooty.com does not allow refunds and does not accept shared payment responsibility. Unfortunately, you should think twice before you provide your credit card details to a business that offers no guarantee or that makes you solely responsible for tricks played by others at exactly the same location. Just watch below how does LocalBooty.com let you know that you stand no chance of returning your investment once you complete the transaction. Moreover, ensure that you don’t mingle and accidentally provide your data to other services via this site, because you will not have any protection whatsoever. 2. There are no security and privacy tools. I didn’t notice any particular additions that can serve as security protection against credit card fraud, privacy invasion or account hacking. Expecting at least an SSL certificate, I was quite aware that I am dealing with a scammy service when I couldn’t find any. I suggest you take an alternate route to one of the professional adult dating services that utilize all necessary safety measures. 3. Fake profiles of Internet stars. Well, Emily Sears turns out to have a profile on LocalBooty.com. Does she really?! The Australian bombshell is under no condition a member of this site where the same photo is attached to a profile of a girl claiming to be from Washington DC. This is how fabricated profiles are applied on fake dating sites just to make you think that there are awesome hookups possible aplenty. 4. Same profile matching from different locations. 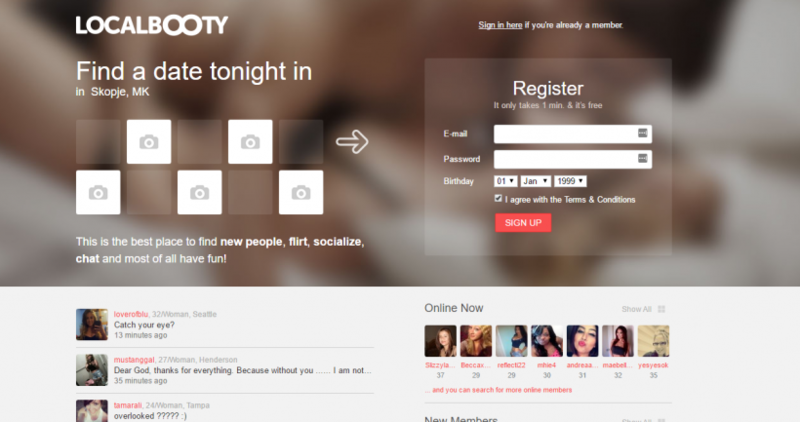 The phony girl profiles made me take another look at the search tool and how it works. Are there true matches on LocalBooty.com. As it turned out, there are not. I started a search from my U.S. location and ended with the same search results when I did New Zealand, too. Unless hundreds of members are on a constant move across continents, this stinks scam. I’d say the latter is the truth. My inbox was full with offers and fake messages from girls with whom I never contacted. I know that many messages out of nowhere are usually a bad sign for a dating site credibility, too good to be true and just a catch to make me think that I have the hookup offer of the century, when I am only warmed up into submitting my card for an updgrade. The final verdict from this review is not in favor of LocalBooty.com. You may try the tour yourself or you may just stay on the safe side and look to join one of the genuine dating services. LocalBooty.com is designed to pull a bait by stating free registration, then lure you in into an upgrade by sending you fake messages from fabricated profiles, and, in the end, having no chance of a refund because you agreed to the provision. I am sick of this site’s messaging, got any idea how to sign out?